Times listed are when the first ball hits the lanes. If you want some practice rolls, please arrive 15 minutes early. It’s that time of the skeeson again! Time to square off to determine the best team of our milestone Skeeson 10. Festivities kick off at 4, with the presentation of league shirts. And we’ll wrap up with the awards ceremony after the victorious team chugs from the Brewskee Mug. Tuesday, April 16, at 7:30, we’ll be holding our annual Best Roller of the Year tournament. The top 16 rollers in the league will square off to crown our best roller, who will chug from the BROTY chalice. The Hundo Challenge will follow immediately after. No qualifications necessary for the Hundo Challenge — anyone in the league is welcome to try their hand! Congratulations to all of our Skeeson 10 award winners! UPDATE: Due to a scheduling conflict with Busby’s, this has been rescheduled for Saturday, April 20, at 5 pm. • Registration will open at 5pm. It's not even registration, per se — just show up, and you’re in! "Registration" will close promptly at 5:30, so make sure to get there no later than 5:30 if you want to play. • Scoring will be done by ranking. Why? Cuz it’s easier. Trying to figure out how a 330 in Skee-Ball compares to a 285,000 in pinball compares to a four over par in mini golf is, well, flippin’ impossible. So we’re just going to rank all the scores in each game and go from there. Once everyone has completed an event, their scores will be ranked. First place in each event will get 25 points, second place will get 21 points, and so on. The person/team with the most total points after all five events wins! • And now…prizes! The third-place team will receive a vintage Brewskee-Ball L.A. shirt of their choosing. 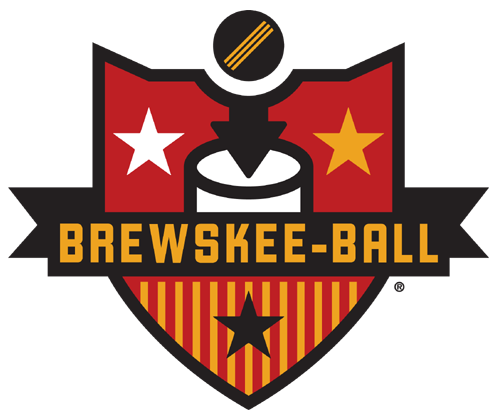 The second-place team will receive a Brewskee-Ball L.A. shirt and a round of drinks. And the first-place team will receive a Brewskee-Ball L.A. shirt, a round of drinks, and this trophy commemorating their victory. Brewskee-Ball matches take approximately one hour. Teams will be given a scheduled time slot each week, at either 6:30, 7:30, 8:30, or 9:30. For those with limited Tuesday-night availability, please contact us. Thank you for your inquiry! Your local Skee.E.O will be in touch soon.